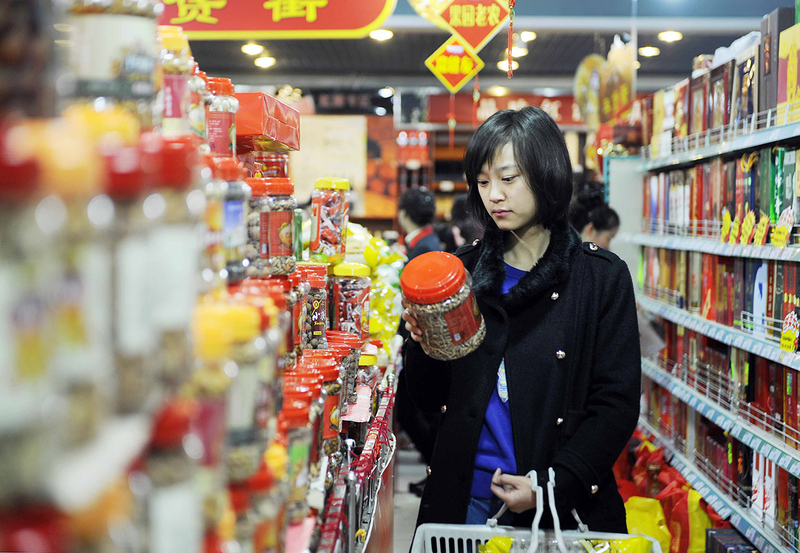 A customer chooses leisure food in a supermarket in Yinchuan, capital of northwest China's Ningxia Hui Autonomous Region. Russian companies are optimistic that the sale of cheap grain and high-quality sweets will help create a climate of “comprehensive strategic cooperation” with China. However, they face completion in the Chinese market from more familiar food brands from the U.S., Australia and New Zealand. Despite low export prices (and Xi Jinping’s craving for Russian ice cream), Russia's food producers face daunting challenges in entering a highly competitive market. Probably, the biggest problem at the moment is that Russian producers are simply unaware of the specifics of the Chinese market. If Russian exporters are thinking about making a long-term commitment to China, they should come up with a clear strategy and remain patient in their efforts to win over Chinese consumers. Russian food products were practically absent in the Chinese market for over 20 years. During this period, China became the largest food market in the world. “We have just started to invade the Chinese market,” Alexander Tkachev, Russian Minister of Agriculture, said in a recent interview with state-run TV station Russia24. The “invasion” Tkachev referred to is a 1.5-million ton grain supply contract signed between China and Russia at the end of March 2017. China accounts for 11 percent of Russian exports (this number has increased from 6 percent in 2013). China is the largest importer of Russian food, mostly in the form of raw food products: frozen seafood (about 60 percent of Chinese imports), soybeans, soy oil and sunflower oil. At the moment, Russia's share of Chinese food imports is relatively small. While the U.S. sells $26 billion worth of food products to China every year, Russian exports to China accounted for just $1.13 billion during the first 9 months of 2016. The big question is whether Chinese customers will be interested in Russian food products besides raw fish and unprocessed grain. Most observers in Russia are putting high hopes on the growing purchasing power of the Chinese. “The Chinese are becoming richer and are expanding their demand for basic products. Russian mineral water, wheat, meat (especially pork), fish, and dairy products have good prospects on the Chinese market,” says Oleg Remyga, head of the China Studies Lab at the Skolkovo Moscow School of Management. General statistics back up the expectations of Russian firms and prove that the Chinese have started to consume more, in conjunction with the country’s economy growth. China has almost doubled its GDP per capita since 2007 and the Chinese average annual salary has grown dramatically over the last 6-7 years. Consumer spending in China has shown a 150 percent increase since 2007 and this type of growth is expected to continue. According to McKinsey’s recent research findings, the Chinese have become more sophisticated and selective in all aspects of consumption. In addition to this, they are also becoming more concerned about food safety and nutrition quality. At the moment, Russian food companies bank on low-priced and high-quality products in their quest for carving out a niche in the Chinese market. “Russian products are 10-30 percent cheaper than their European or American counterparts. On the other hand, Russian sweets and cookies boast the same quality and perform even better according to their price-to-quality ratio,” a source from the Russian export industry, who is not authorized to speak to the media, said. Using this competitive advantage, the largest and oldest confectionery holdings of Russia, have already been trying to win over Chinese consumers for several years with brands ‘Alyonka’ and ‘Korovka’. President Xi Jinping has also paid lip service to the Russian sweets industry by telling Vladimir Putin that he likes Russian ice cream. However, even Alexey Gruzdev, Russia’s trade representative in China slightly deters the hopes of Russian exporters. He said in a recent interview that Russian exporters should build up a long-term strategy to become more recognizable in the Chinese market, because, low prices are insufficient to secure a future for Russia's food industry in China, and there is a need for a strategic business development. Artem Zhdanov, a co-owner and marketing director of the UChina consulting company, is also quite skeptical about the existing appeal of Russian products to Chinese consumers. China's Heilongjiang Province is now the biggest consumer of Russian food products in the country. Russia accounts for about 16.6 percent of all foreign trade of the province that is located right on the Sino-Russian border. Local media there is actually beginning to highlight the advantages of “eco-friendly food” from Russia and to discuss the prospects of trade growth between two countries. But the province itself ranks only 21stin the list of Chinese provinces according to GRP and is not the biggest market there. Apparently, there is no chance for Russian producers to extend their reach beyond the Heilongjiang Province without adapting their products to Chinese tastes. “Most Chinese don't like sweet or fat products, so there needs to be less sugar and oil in these goods,” a source from the Russian export industry said. Big marketing campaigns are also required to win over Chinese consumers, according to Artem Zhdanov. “Only a few Russian companies could afford large advertising campaigns, even in a single province,” he said. Despite the weak representation of Russian food products in the Chinese market, Ivan Zuenko, a research fellow at Center for Asia Pacific Studies of Russian Academy of Sciences’ Far Eastern Branch, believes that there are few steps that Russian authorities could take in order to help improve the situation. “The most important thing that only the authorities are capable of doing is the creation and development of a ‘Made in Russia’ brand which focuses on the ecological advantages of Russian products. Without the government's involvement, even our largest exporters will be unable to develop this brand,” Zuenko said. Artem Zhdanov thinks that the branding process could be initiated by the involvement of the Russian Export Center (REC), a development institution created in 2015 with the support of Russian government and Vnesheconombank (VEB). The REC already makes an effort to help Russian exporters enter the Chinese market by organizing their participation in various trade exhibitions. “The right thing to do is to create some kind of association of exporters aimed at the Chinese market with the support of the REC and the government. Such an association could start working on brand development in the China’s market, for example,” Zhdanov said. Despite the close political ties between Moscow and Beijing, bilateral trade has been consistently declining during the past few years. 2016 trade turnover finally showed a 2.2 percent increase and reached $69.5 billion. However, trade turnover between the two countries is comparatively small, and it remains very disproportional. China is the leading exporter to Russia, while Moscow is 16th in the list of China's major trade partners. Russian exports to China are dominated by hydrocarbons, with oil and gas amounting to more than 60 percent of these exports.